N.T. Wright has written extensively about Jesus already, so why would he need another book? 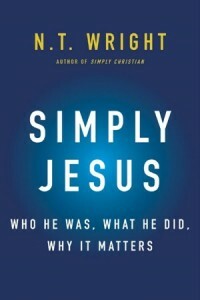 The truth is, Simply Jesus, is the summation of all that Wright has written about Jesus, from The New Testament & The People of God to Jesus and the Victory of God to The Challenge of Jesus, as well as the line of thought he began laying out with Simply Christian, Surprised by Hope, and After You Believe. 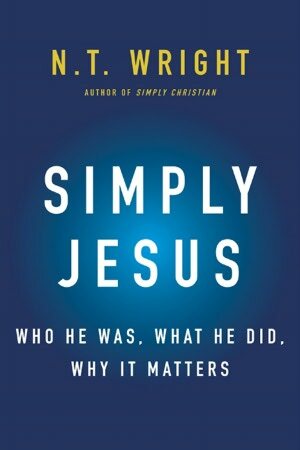 All of that comes together in this eminently readable, concise tour de force called Simply Jesus. If you’re familiar with N.T. Wright, there isn’t much that’s new in this book. It’s value, however, lies in that his whole career of thinking on Jesus comes together in this single volume. What is more, it is far more practical than much of his previous work, drawing especially on what he brilliantly laid out in After You Believe. If you’re not familiar with N.T. Wright and his work, this would be an excellent place to start. The foundation of Wright’s work is history, particularly the first-century history of Roman-occupied Israel. “We have to make a real effort to see things from a first-century Jewish point of view, if we are to understand what Jesus was all about.” (xii) To miss Jesus in his own context would be to miss him entirely. And so he works quickly through the historical material he painstakingly laid out in his Christian Origins and the Question of God series. From this work he draws the metaphor of the perfect storm–of three storm fronts colliding at one point at the same time. The three storm fronts of Jesus’ day were the Roman Empire, the Jewish Hopes of Liberation, and the Work of God in the Person of Jesus. These three forces crashed into one another for the three years between the baptism of Jesus by John and his crucifixion by the Romans at the behest of the Jewish leaders. These three years of Jesus’ ministry were, as Wright puts it often in this book, “what it looks like when Israel’s God becomes King on earth as he is in heaven.” The sick are healed. The blind are given sight. The lame walk. The dead are raised. The demon-possessed are set free. This is how the world works when it’s Creator God is King, and that’s exactly what was happening in and through Jesus. The tyrant that Jesus came to overthrow was not Rome, as everyone in Israel had hoped and expected to one day happen. The tyrant was “the Satan”, the Accuser, and his weapons of sin and death. Jesus is now King. And he is enacting his rule and reign through his body, his disciples, on earth as it is in heaven. Our task, then, is to go about proclaiming that he is King, and enacting his kingdom in the same way in which he went about inaugurating it–by laying down his life on the cross, displaying God’s agape love for the world. This is an outstanding book, and I highly recommend it to every believer, and to every nonbeliever who wants to know more about who Jesus was and is.